As promised, we're live at San Francisco City Hall, where the city's Municipal Transportation Agency will vote this afternoon on a proposal to allow corporate shuttles to share public stops with Muni buses. For those not in the know, it remains a contentious issue in the city: Buses have been blocked (repeatedly). Theatrics have been staged. Opinions have been hurled. Rocks have been thrown. And things like ferry service and private security haven't exactly done much to ease the public's perception of an elitist tech industry. If passed, the proposed plan would charge companies $1 per stop at 200 Muni stops across the city. If you're just tuning in to San Francisco politics, there will be a period of public comment before the board votes on the matter. In this case, Google has provided a script for their employees (those who could get out of work anyway) to follow when speaking in support of the plan. 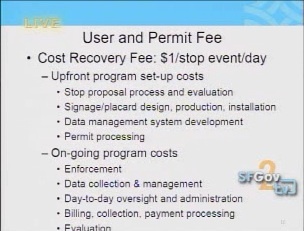 On the other hand, San Francisco's League of Pissed Off Voters has provided an alternate set of speaking points: mainly claiming that they do not wish to speak ill of tech workers, but they feel the the $1 fee should be increased to compensate for Muni delays and the tech shuttles' impact on housing costs. In our experience, however, public comment almost always plays out like an episode of Parks & Recreation, with most of the speakers veering wildly off track. (We would not be surprised to hear a couple conspiracy theories, for instance.) 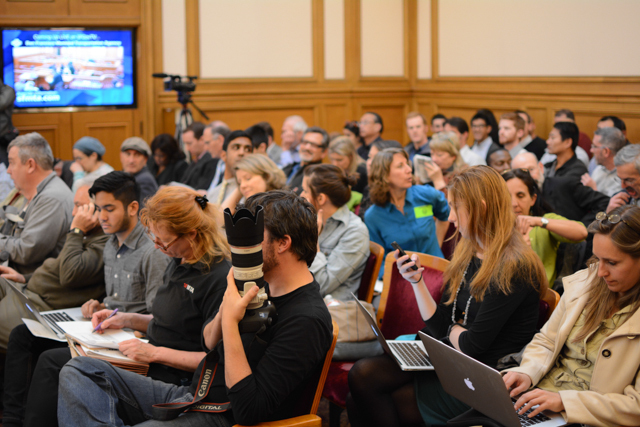 For those following along at home, the hearing will be broadcast live starting at 1 p.m. on SFGovTV Channel 2 and SFist will be bringing you updates throughout. Standing room only in SF City Hall for SF tech shuttle hearing. Lots of protesters from #stopsfevictions are here. Board member Tom Nolan quips, "I see the press is all here for our election of officers." Which gets some laughter from the peanut gallery, since no one here cares about SFMTA meetings until the tech industry gets involved. 1:30 p.m. Before we get to the corporate shuttle item, S.F. Director of Transportation Ed Reiskin took a moment to honor 32-year hero Bond Yee and talk about pedestrian deaths and safety. There was a rally earlier today on the steps of city hall to support the city's new Vision Zero plan. The journalists in the room, many of whom usually cover a tech beat, are taking a moment to chit chat on Twitter. 1:40 p.m. Meanwhile, over on Facebook: local writer Rebecca Solnit, who has been very vocal about her feelings on how corporate shuttles are ruining San Francisco culture, is comparing the shuttles to the 1955 bus segregation in Selma Montgomery, Alabama. Solnit herself seems conflicted about the troubling comparison, she writes: "on this day that the hearings on the Google Bus are to be held in San Francisco it seems to have some relevance--but what, exactly? I think class segregation and privatization might be one way of framing it (though I don't think protesters are eager to ride the Google Bus, exactly)....... Let my city go." 2:10 p.m. Here we go: Agenda Item 14 is up on the docket. We're addressing the plan to charge shuttle companies $1 per stop at 200 Muni stops across the city. SFMTA's Carli Paine is describing the study that led to the proposal: so far, it's been SFMTA policy to address problems on an ad hoc-basis. We're getting background on the commuter shuttle sector, which has two main divisions: Intra-city shuttles and regional shuttles whose final destinations are outside the city. 80% of the shuttle boardings are actually intra-city shuttles. Meaning the riders are going to places within the city that either aren't reached by Muni or the shuttles are provided to allow riders to skip Muni. Shuttle providers would be permitted by the city and in addition to the fee paid to the city, each would be required to be clearly identified (as it is now, most of the buses for Google, Apple, Facebook, etc are simply unmarked grey or white buses). They would also be required to provide data on their routes and usage, to pay citations and comply with all other CA PUC requirements. 2:35 p.m. Supervisor Scott Wiener is speaking in favor of the proposal. His district includes most of the Castro and Noe Valley as well as parts of the Mission and Lower Haight. "It is absolutely the case, these shuttles are part of our goal to be a transit-first city. 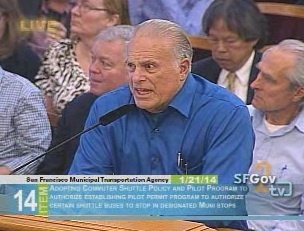 We know that no matter how good Muni is... it does not always meet everyone's needs." Commuting to Silicon Valley is not a new thing, Wiener says, and for many people taking a Muni and CalTrain is not an efficient way to commute south. Regarding the cost of housing in the city: Supervisor Wiener expressed his compassion for the struggle, but stood up for tech workers saying: "demonizing these shuttles" is not a real solution. Someone in the crowd hissed at him. Others clapped. 2:40 p.m. Supervisor David Campos, whose district mainly covers the Mission, asked the board to send this proposal back for revisions. "I think this proposal exacerbates the problem." Applause. 2:50 p.m. Public comment has started. Google employee Crystal Schultz describes moving to San Francisco to "find a better life." She lives in the Mission and walks everywhere on the weekend. "Not everyone at Google is millionaire." She also works on Google Maps, which means the city actually needs her to get to the office in order for the pilot to work. Google employee takes issue with “luxury bus” wording at SFMTA hearing: “It’s just a thing on wheels that gets us to work." Izumi Torre, 40-year San Francisco resident says the fee is way too low because one time she got a very expensive ticket from "a meter man" while dropping her husband off in a Muni stop in front of City Lights Bookstore. In an impassioned speech, one public commenter became the first to call the proposal "a cover-up" that has been going on for years, claiming the shuttles are a symptom of "unbridled capitalism" and "class warfare." He also claimed the city should be charging them billions and using the money to pay for housing. He didn't exactly back up his points with sources, but his speech was met with applause anyhow. 3:10 p.m.The general vibe from public commenters at the moment (the one Google employee notwithstanding) seems to be focusing on the fact that tech companies have tons of money while the city, Muni and the people affected by Muni delays do not. 3:25 p.m.We've heard from the League of Pissed Off Voters, a conspiracy theorist, one concerned mother, SPUR, and a representative with a petition of more than 100 signatures supporting the proposal, among others. SPUR, the SF-based urban planning think tank, most notably expressed concern about adopting the proposed plan. SF resident proposes tech buses pay at least $2 per stop, which is what MUNI riders pay, "not per bus, but per passenger." Another commenter quoted Google's prescribed script verbatim, saying: "I urge the Board to adopt this pilot as a reasonable step in the right direction." Noted author Richard Becker (below), sarcastically said he was "surprised" to hear that the survey of bus riders discovered that shuttle riders enjoy not driving to work. He also complained about parking tickets. Basically, anyone who has ever gotten a parking ticket hates shuttle buses. 3:50 p.m. A female employee of Bauer's IT Transportation also got fired up in her company's defense. She pointed out that her company does not build high-rises, "shuttles have nothing to do with Google housing" and that she has also lived in the Mission "forever." That was before she said she lived in Brooklyn for eight years, so not all these comments make sense, necessarily. 4:00 p.m. Most of the TV news media have dipped out on 5 or 6 p.m. deadlines, but there are still a handful of commenters left. One surprisingly cogent commenter called on the SFMTA to look into a central terminus. 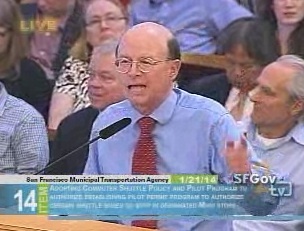 Another, more passionate Mission resident called for a study of the "real impact" of the shuttle buses. He pointed to the long-gone 26-Valencia Muni bus as an example that the city was turning its back on locals, like the children in the neighborhood who he claimed are getting to school late due to delays caused by shuttles. He was followed by another woman who toed Google's party line: "If the shuttles were taken away, I would drive." "Let me just say I hate the shuttles." - This Guy. 4:10 p.m. Public comment is over and the SFMTA Board of Directors is debating the comment and wrapping things up before a vote. Vice Chair Cheryl Brinkman offered to support the pilot program, but noted that we need to use the pilot as an opportunity to learn more and further investigate some of the issues addressed during public comment. 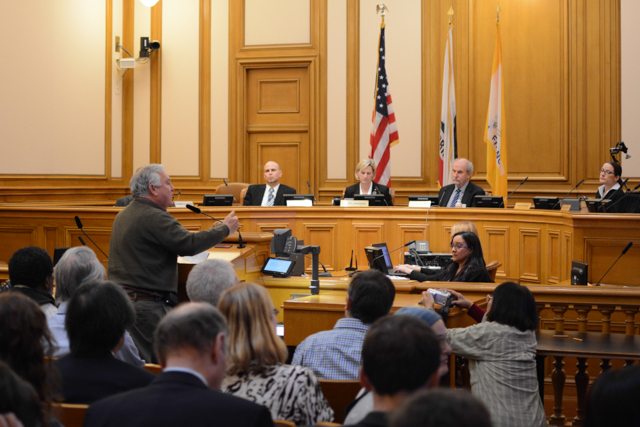 Board member Joel Ramos piled on with the S.F.-nativism, but addressed a similar concern. With very little ceremony and a modicum of discussion, the Board officially and unanimously passed the pilot program of the tech shuttle plan. There you go, folks: $1 per bus per stop.